The Protestant marching orders have said they can simply bypass the Parades Commission in the future after loyalist flags protestors held scores of parades last month without any approval. 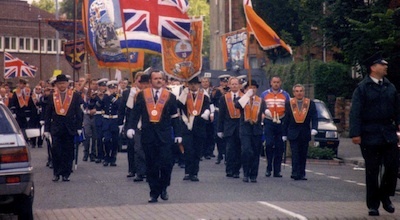 The Parades Commission was established in 1997 in the wake of loyalist violence linked to the highly contentious Drumcree parade during the mid-1990s. However, the body has become increasingly irrelevant in recent years as marchers and the PSNI police have routinely ignored their rulings. The issue became undeniable last month when loyalists protesting against a change in Belfast City Hall’s policy on flying the British flag were allowed to hold over a hundred marches without even informing the Commission. Rev Mervyn Gibson, the grand chaplain of the anti-Catholic Orange Order in Belfast, said loyalist flag protesters had been able to march unchecked from east Belfast to the city centre every Saturday. He said there was a “loophole” in the law on parading. “We will do what we need to do to get our parades and our culture celebrated in a way which threatens no-one,” he said. In response, the Parades Commission appeared to blame the PSNI. They said today [Friday] that “the law is very clear” and that it is an offence to organise or participate in a parade that has not been appropriately notified to the PSNI. However, earlier this week, PSNI Assistant Chief Will Kerr indicated that his force would continue to avoid any intervention that might anger the loyalist community. He said that due to the potential for loyalist violence. this was “the least worst option”. Former SDLP deputy leader Brid Rodgers accused the Parades Commission of “washing their hands” of responsibility amid the parades chaos. Commissioners also faced calls to act from Fianna Fail leader Micheal Martin who said the organisation must “assert its authority” on the parading issue. Sinn Féin Assembly member Gerry Kelly said the PSNI should refer parade matters to the commission. “The PSNI are part of the problem as instead of notifying the Parades Commission of these ongoing contentious parades -- and in particular those past Short Strand -- they are dealing with the issue themselves,” he said. The controversy has increased ahead of the first Orange Order march of the year which is to take place tomorrow (Saturday) from east Belfast to the city centre. The Parades Commission has issued restrictions on the march, which passes the nationalist Short Strand and St Matthew’s Catholic Church. Sinn Féin said there are concerns among the nationalist community who have had “no let-up” in loyalist protests since the start of December. Violence has flared during parades in the area on several occasions since Belfast City Council voted to reduce the flying of the British Union Jack at the city hall. St Matthew’s Church has been targeted during the riots. On the nationalist side, a Short Strand resident is to challenge the British government and the PSNI over the handling of the flag protests, in the courts. A judge has granted leave for a judicial review as the resident has argued the parades are illegal and should be stopped. A decision is not expected until April.